EastEnders Mitchell sisters to be reunited? EastEnders‘ recently-deceased Mitchell sisters Rita Simons and Samantha Womack could be reunited on Strictly Come Dancing. The pair said goodbye to the London-based soap on New Year’s Day 2017, after their alter-egos Roxy and Ronnie died in a tragic swimming pool misadventure. However, BBC bosses are desperate for their chemistry not to go to waste and are hoping to sign the girls for this year’s Strictly Come Dancing. According to The Sun newspaper, a source said: “It’s fair to say that people are keen to sign at least one of them and if at all possible both of the girls for the new series. “Obviously it’s early days and lists are still being drawn up for potential candidates as there are all kinds of commitments that people have for the coming months. Simons and Womack were regulars on EastEnders for nine years, during which their characters dealt with their abusive father, numerous relationship issues and Ronnie’s infamous baby swap storyline. They announced their decision to leave the soap together last August. Greg Rutherford reportedly experienced a “total meltdown” and threatened to quit Strictly Come Dancing after the judges criticised his performance last weekend. The Olympian delivered a Rumba routine to “Bring Me To Life” by Evanescence with his professional partner Natelie Lowe, but was allegedly left fuming after judge Craig Revel Horwood awarded him a mere 4/10 for the performance. Four people had to step in to calm the celebrity down as he raged about the injustice of their score. The insider explained: “Four people had to restrain him as he insisted that he was done with the show. However, a friend of Greg has insisted that this angry behaviour behind the scenes stems from him being a “natural sportsperson” and competitor. They said: “Greg is a natural sportsperson and as such has a desire to be the best in everything that he does. Hopefully Greg and Natalie will be able to turn things around this week with their Viennese Waltz to “You Don’t Own Me” by Grace. To see the full confirmed song and dance list, click here. Anastacia and Brendan Cole became the sixth couple to depart from the competition last Sunday when they were voted into the bottom two alongside Daisy Lowe and Aljaz Skorjanec. Unfortunately, their Jive routine failed to impress the judges and the dancing duo were forced to bid adieu to the competition. Now, the remaining couples are back to more traditional dances on Strictly, after a spooky Halloween edition of the show last week. And this song and dance list looks as though it could be the most challenging one yet, with the first Argentine Tango of the series! Claudia and AJ will be dancing the Paso Doble to “Shutup and Dance” by Walk The Moon. Daisy and Aljaz will be dancing the Viennese Waltz to “Daisy Bell” by Harry Dacre. Danny and Oti will be dancing the Jive to “Long Tall Sally” by Little Richard. Ed and Katya will be dancing the Quickstep to “Help! '” by The Beatles. Greg and Natalie will be dancing the Viennese Waltz to “You Don’t Own Me” by Grace. Judge Rinder and Oksana will be dancing the Quickstep to the Chantz Powell version of “It Don’t Mean A Thing (If It Ain’t Got That Swing)”. Laura and Giovanni will be dancing the Samba to “Bamboleo” by Gipsy Kings. Louise and Kevin will be dancing the Argentine Tango to “Tanguera” by Sexteto Mayor. Ore and Joanne will be dancing the Salsa to “Turn The Beat Around” by Vicki Sue Robinson. Judge Rinder has shared truly epic plans for his performance on Strictly Come Dancing this weekend. Judge Rinder and his professional dancing partner Oksana Platero will be dancing the Paso Doble to “Born This Way” by Lady Gaga on Saturday evening for the Halloween-themed episode of Strictly. And the routine sounds like it could really be one of a kind. Speaking on The One Show, Oksana admitted: “We’re not taking a traditional approach to Paso Doble, we’re going to be a moth and a butterfly. The pair delivered an energetic jive to “Boogie Woogie Bugle Boy” by The Andrews Sisters last week. However, Judge Rinder has said he was rather disappointed with its reception from the judges. He said on It Takes Two this week: “We’d like to have broken the 30 barrier. “Poor Craig, as I said on the night, there’s so much going on under that desk I don’t think he could find the right paddle which was sad. Will Rinder’s flying stunt finally push him past the 30 mark barrier? We’re certainly excited to see it. Which Strictly Come Dancing contestant might be forced to quit? Laura Whitmore has warned fans that she might be at risk of having to leave the Strictly Come Dancing competition. The TV presenter was ruled out of last Saturday night’s show after being diagnosed with a “myotendinous strain of the right flexor hallucis longus muscle”. Laura told fans the build up of fluid in her leg swollen her ankle and left her unable to walk, but luckily she was allowed a chance to recover before continuing on into the next week. However, it appears as though the injury has not completely healed in time for this weekend’s performance. Writing for Glamour Magazine, she explained: “From today [Tuesday], I should be allowed to start training again as I’ve had almost five days off my feet and the swelling has reduced, but the fear is, if it’s not fully recovered it could get inflamed again. Laura and her professional partner Giovanni Pernice are set to perform the Tango this week, dancing to “Paint It Black” by The Rolling Stones for the Halloween edition of the show. You can check out the full song and dance list here. Hopefully Laura will make a speedy recovery in time for the show. 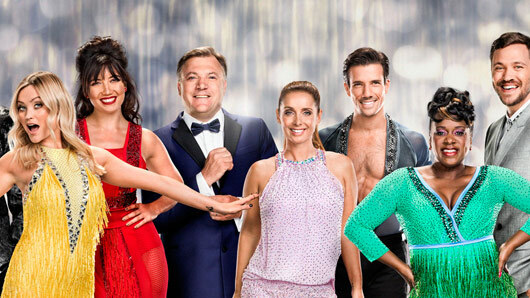 The song and dance list for Strictly Come Dancing week six has been unveiled. Last week, we said goodbye to Birds of a Feather actress Lesley Joseph and dance partner Anton Du Beke, while fellow bottom-two contestant Daisy Lowe survived to dance another week. This weekend the song choices all have a spooky something, to celebrate Halloween. Bookies favourite Danny Mac will dance the foxtrot with partner Oti Mabuse to ‘Take Me To Church’, while at the other end of the scale Ed Balls and Katja Jones will be hoping for a little bit of magic with their cha-cha to ‘Love Potion No. 9’. Anastacia and Brendan Cole will dance the jive to ‘Bat Out Of Hell’ by Meat Loaf. Claudia Fragapane and AJ Pritchard will dance the American Smooth to ‘Black Magic’ by Little Mix. Daisy Lowe and Aljaž Skorjanec will dance the paso doble to the Santa Esmeralda version of ‘Don’t Let Me Be Misunderstood’. Danny Mac and Oti Mabuse will dance the foxtrot to ‘Take Me To Church’ by Hozier. Ed Balls and Katya Jones will dance the cha-cha to the Hansel Martinez version of ‘Love Potion No. 9’. Greg Rutherford and Natalie Lowe will dance the rumba to ‘Bring Me To Life’ by Evanescence. Laura Whitmore and Giovanni Pernice will dance the tango to ‘Paint It Black’ by The Rolling Stones. Louise Redknapp and Kevin Clifton will dance the Charleston to Emeli Sandé’s version of ‘Crazy In Love’. Ore Oduba and Joanne Clifton will dance the Charleston to the Bow Wow Wow version of ‘I Want Candy’. Strictly Come Dancing continues next Saturday (October 29) at 6.45pm on BBC One.